Why Stormtroopers can't hit anything. Yoo hoo! Star Wars fans, ... Greedo shot first. OK, I'm sorry, it was just a joke, ... Han shot first!
" 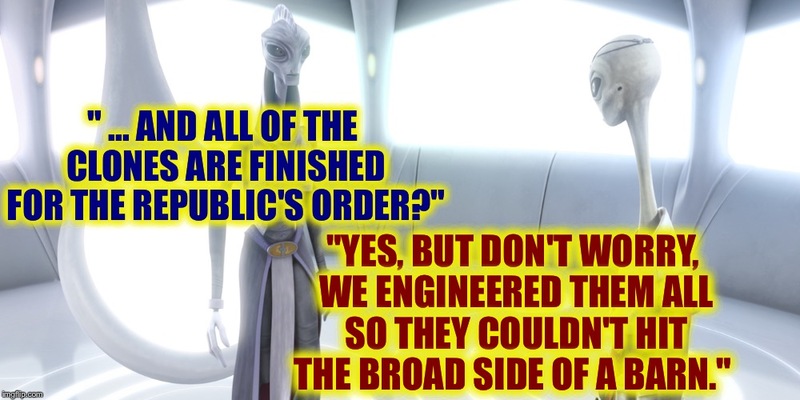 ... AND ALL OF THE CLONES ARE FINISHED FOR THE REPUBLIC'S ORDER? "; "YES, BUT DON'T WORRY, WE ENGINEERED THEM ALL SO THEY COULDN'T HIT THE BROAD SIDE OF A BARN."